The first-person shooter movie stars Alfie Allen (Game of Thrones), Mekhi Phifer (Insurgent), Missi Pyle (Gone Girl), Rachel Nichols (Star Trek), Paul Guilfoyle (CSI: Crime Scene Investigation), Danielle Rose Russell (Aloha) and Pat Healy (Captain America: The Winter Soldier). Set in the near future, a zombie virus of epic proportions has overtaken the planet. There are more infected than uninfected, and humanity is losing its grip on survival. Its only hope is finding a cure and keeping the infected contained. Lauren (Rachel Nichols) is a doctor, who, after the fall of New York, comes to Los Angeles to lead the charge in the hunt for uninfected civilian survivors. Lauren’s objective is simple – lead her team into the field and rescue survivors. 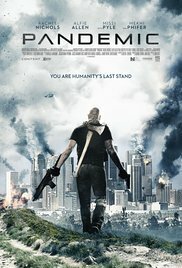 Pandemic was directed by John Suits from a script by Dustin T. Benson, and produced by New Artists Alliance founders Gabriel Cowan and John Suits. It was filmed on location In Los Angeles, CA, and was released in the U.S. in theaters and VOD platforms by XLrator Media on 1st April 2016.